Kites - Raptor Rehabilitation of Kentucky, Inc. The Mississippi Kite is a beautiful, falcon-like bird whose body is overall gray, with a dark tail and wings, and dark feathers around its eyes. They nest primarily in the southern Great Plains and along the Gulf Coast, extending up the Mississippi River to western Kentucky. They migrate through Texas each year on the way to central South America. We had never had one at RROKI until 2010 when we received our first young Kite from the far western part of Kentucky near the Mississippi River. The official abbreviation for the species is MIKI, so that became his name. A raptor which hangs motionless in the air with wings outstretched like a kite in a breeze is said to be "kiting," and the Kites are experts at this. Mississippi Kites roost and nest in woodlands, riparian zones and tree clusters, in colonies. Nesting close together gives them more protection against predators. They like to hunt in human-altered areas such as farms and golf courses, where they capture large insects in flight which livestock and machinery have stirred up. The juveniles will migrate to South America in the fall, then return to their natal area to help an adult pair defend their nest against possible predators. During summer, 2013, something unexpected happened. 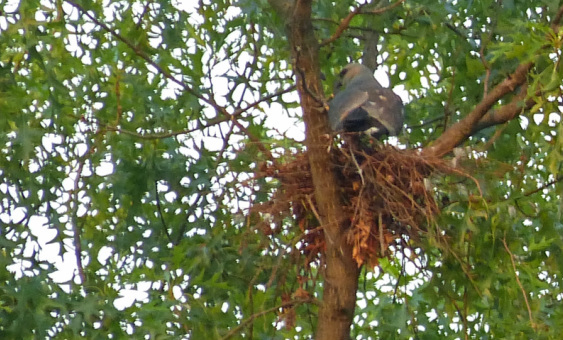 Nesting Mississippi Kites were reported in a suburban Louisville neighborhood for the very first time, very near the house of one of our volunteers. Everyone was excited and surprised to find them in such a habitat, rather then near open fields.